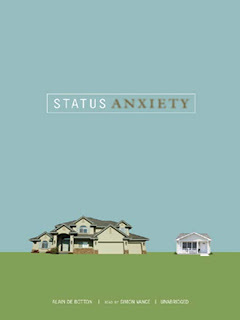 Status Anxiety Series by Alain De Botton Cont'd... Here's the sentimental truth to this fragile thing we call the human ego. Below is another excerpt from the book, as well as Part 1, Episode 2 of the accompanying documentary. 5. How are we affected by an absence of love? Why should being drive us to a "rage and impotent despair" besides which torture itself would be a relief? The attentions of others matter to us because we are afflicted by a congenital uncertainty as to our own value, as a result of which affliction we tend to allow others' appraisals to play a determining role in how we see ourselves. Our sense of identity is held captive by the judgements of those we live among. If they are amused by our jokes, we grow confident in our power to amuse. If they praise us, we develop an impression of high merit. And if they avoid our gaze when we enter a room or look impatient after we have revealed our occupation, we may fall into feelings of self-doubt and worthlessness. 6.Given the precariousness of our self-image, it should not be surprising that, from an emotional point of view no less than from a material one, we are anxious about the place we occupy in the world. This place will determine how much love we are offered and so, in turn, whether we can like or must lose confidence in ourselves. It holds the key to a commodity of unprecedented importance to us: a love without which we will be unable to trust or abide by our own characters.